Congratulations to the first two graduates of the NHE Early Childhood Diploma Programme – Didi Ananda Ragamaya and Didi Ananda Gaorii ! The NHE Diploma Programme began as a pilot programme in the year 2001. It is a dynamic programme which encourages the student to set up their own learning goals and programme of study to meet their personal needs. The student must ask themselves, ‘What do I want and need to learn to be an effective teacher?’ Throughout the course they encouraged to research, analyse, observe, question, criticise, experiment and reflect. This course of study was designed to give a solid base in the development of the teacher, educational theory and practical skills for teaching. Didi Ananda Ragamaya has been a wholetime worker in Ananda Marga for the last 13 years. Her first NHE work was as an LFT in Taiwan 1990 helping in the different schools. She ran the New Day School in Portland Oregon for four months in 1994 and then worked with the children of mothers recovering from drug addiction in the Shields Program for Families in South Central Los Angeles, from 1994 – 1999 mostly sharing songs, yoga and stories. 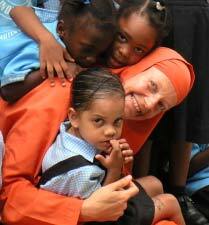 She was the director of the Ananda Marga Kindergarten in Jamaica from Jan 1999 – June 2005. Outreach work in Jamaica , during that time included visiting different schools and sharing with the children an alternative style of learning as well as visiting the Bustamante Children’s Hospital Learning Centre and the Mona Rehab Centre for disabled children. Other work has included serving at the Dudley Grant Education Centre at the University of the West Indies (UWI) which offers special sessions for schools from challenged areas. Currently she is coordinating with the CCDC (Caribbean Child Development Centre) located at UWI the possibility of assessing different early childhood centres in Jamaica, thus hopefully influencing the general education system in a neohumanist way. She is also looking at developing “yoga dance” for children, to distribute to the wider education community. Regarding this NHE course, it was quite a wonderful opportunity for me to consciously explore myself, my life and glean a deeper understanding not only of education but things that are important to me, as well as to develop different skills and knowledge. Personally, the course has been a real growth experience and I am so, so grateful for all the encouragement and support to move ahead with it despite my very hectic and challenging life. Didi Ananda Gaorii has been a wholetimer (WT) worker of Ananda Marga since 1976. She has worked in Manila, Hong Kong and Berlin Sectors as a WT, and also in Delhi and Suva Sectors as an LFT. She has been involved with Neohumanist Education since early in her WT life by starting and running schools, supervising schools, facilitating children and youth activities, camps and seminars, giving NHE seminars, workshops and training. Between 1991 – 1998 Didi worked on helping to set up a global base and system for NHE by: 1. helping to compile all of Baba’s education related writings (as later on published in Discourses on NHE), 2. helping to set up guidelines for NHE school quality standards, 3. compiling a pioneer NHE teachers’ training course. Didi has also published three books of mystical poetry, and has composed a number of devotional songs, including songs for children such as ‘When time began …’ in the COL book. She is currently director of pre, primary and junior high school with over 300 children in Manila Sector. Her contact address is anandagaorii@gmail.com. She would love to have more input in her school so if you’d like more details about the project please write to her. I am impressed by the professional contents of the course materials and also that it necessitates an action-oriented approach to learning. A great deal of work has gone into putting it together and it has been a pleasure to be part of that process as past part contributor and as a guinea pig student.